A soft squeezable bottle with spoon helps baby learn textures and experience a spoon. 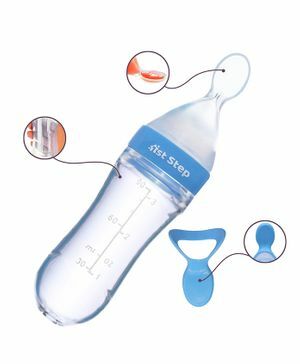 It is suitable for the first stage of weaning with juice, soup or soft solids When you squeeze the bottle, the contents will flow slowly into the spoon. It allows you to feed easily and smoothly Ideal for introducing baby to spoon feeding.